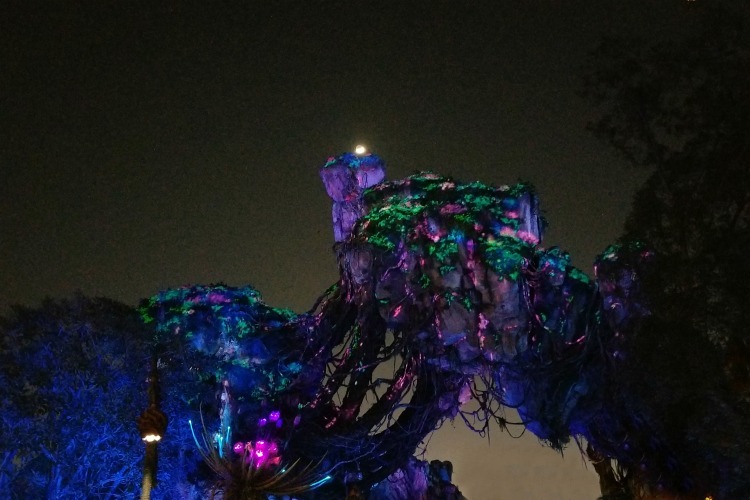 Want to know why you should include Animal Kingdom at night when you’re planning your next Disney World itinerary? It used to be that a visit to the Disney theme parks included a trip to Animal Kingdom during the day, then it was off to the other parks for the fireworks and other popular nighttime attractions. 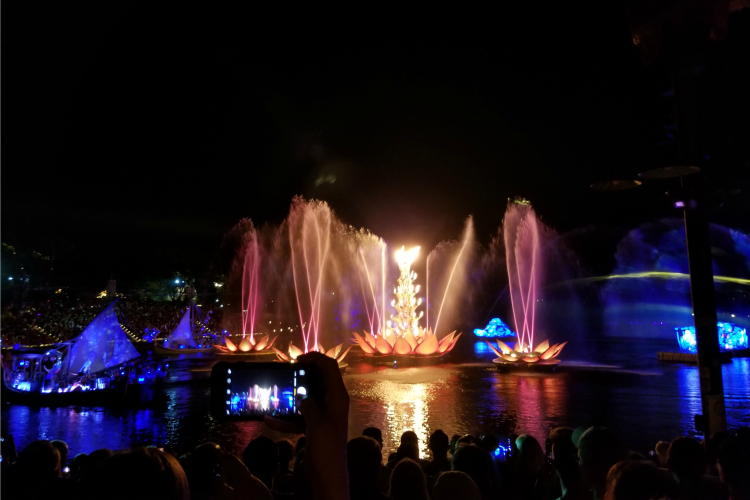 Find out why this is no longer the case and why a visit to Animal Kingdom at night should be high on your Disney World to-do list! It used to be that when we visited the Disney theme parks, we’d do Animal Kingdom during the day and once the sun went down, head to the other parks for fireworks and other nighttime shows. That’s no longer the case. 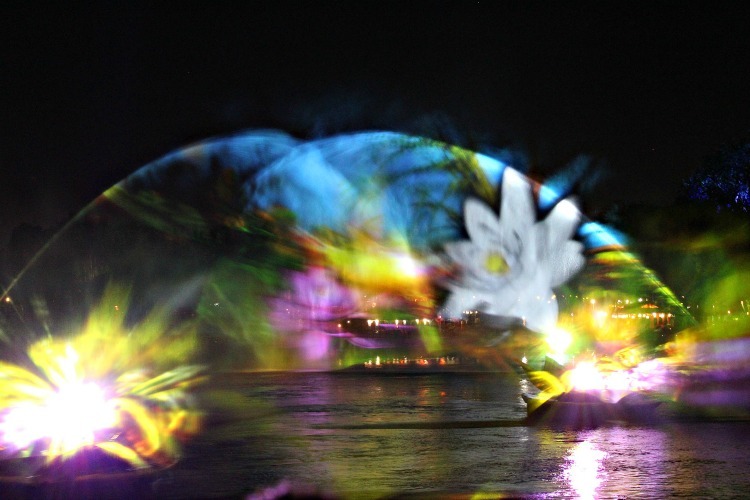 Disney has added so many nighttime attractions at Animal Kingdom that you don’t have to go anywhere else. Now you can have just as much fun at night as you do during the day. 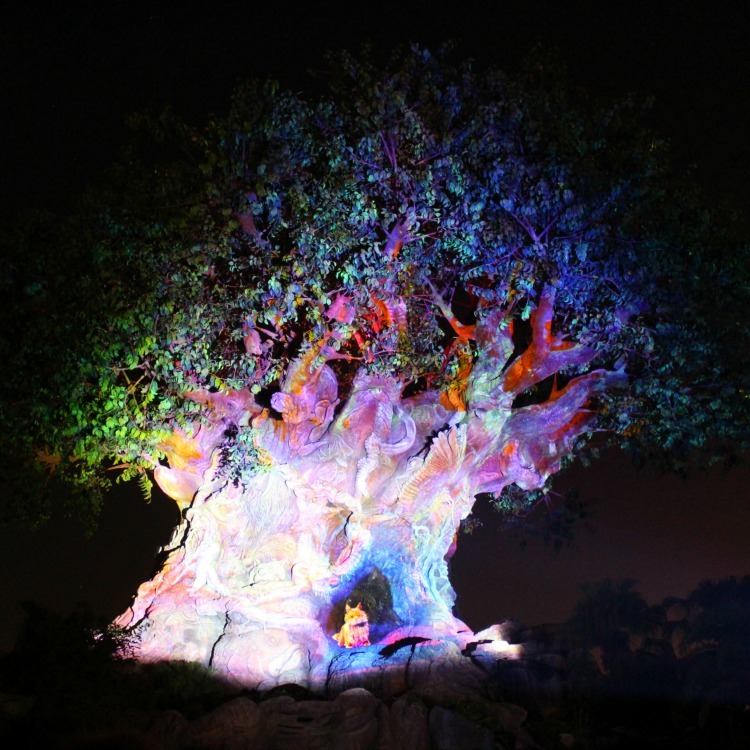 Keep reading to find out why we’re such big fans of Animal Kingdom at night! 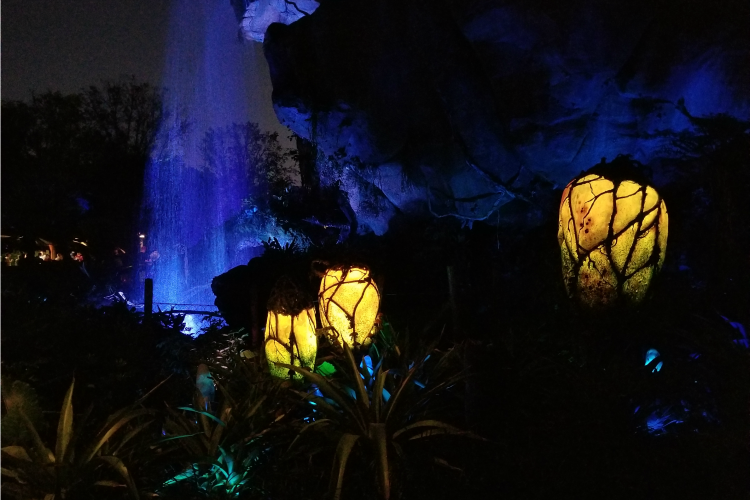 If you only have time to see one thing in Animal Kingdom at night, make sure it’s Pandora. While it’s beautiful during the day, at night it’s absolutely spectacular! 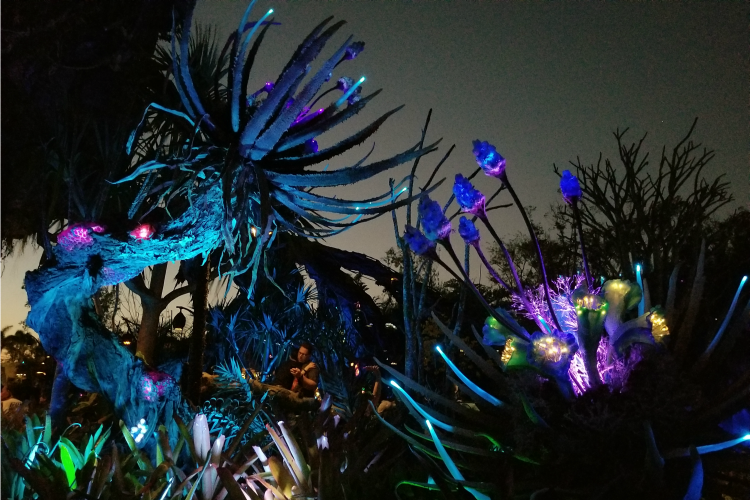 Once the sun begins to set, you’ll see the plants slowly begin to light up. As the sun set lower, we noticed everything around us glowing brighter. 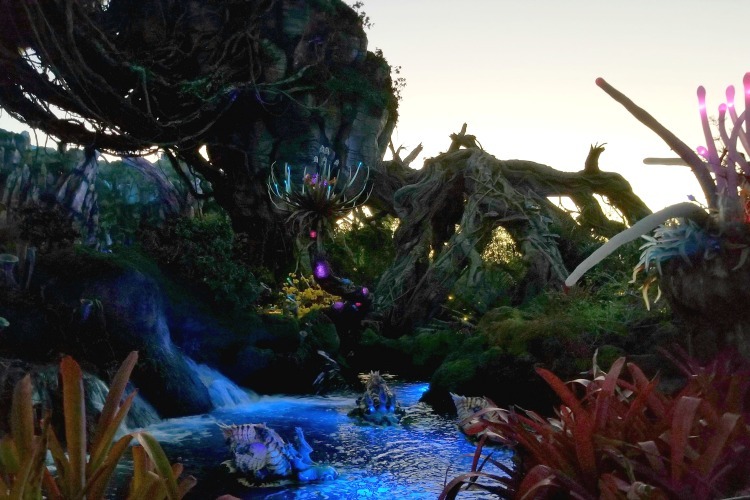 Once the sun sets, you’ll get the full effect of how amazing Pandora is at night. 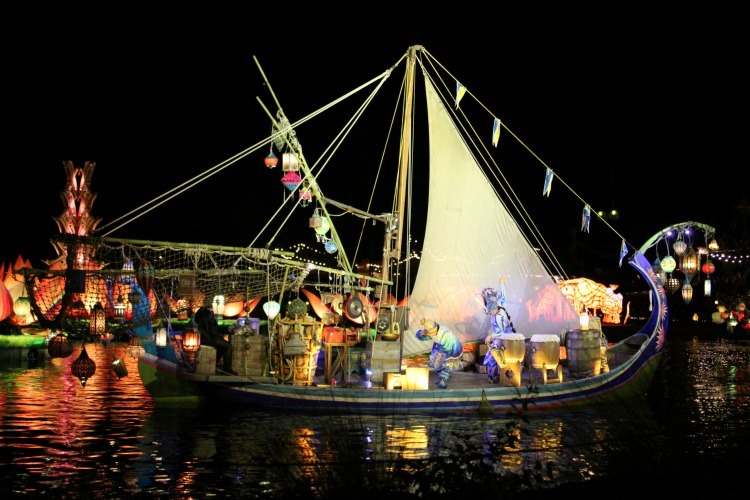 It is transformed into a magical, bioluminescent world that you have to see to believe. There’s plenty to see on the ground but look up, and you’ll also see the floating mountains lit up against the dark sky. There was so much to see and the kids enjoyed it just as much as the adults. 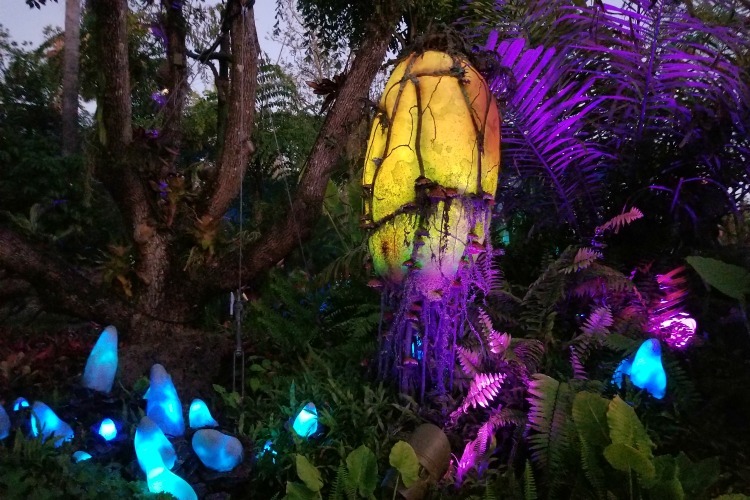 While the main Pandora attractions are Avatar Flight Of Passage and the Na’vi River Journey, the lights of Pandora at night could easily qualify as a not to be missed third attraction. 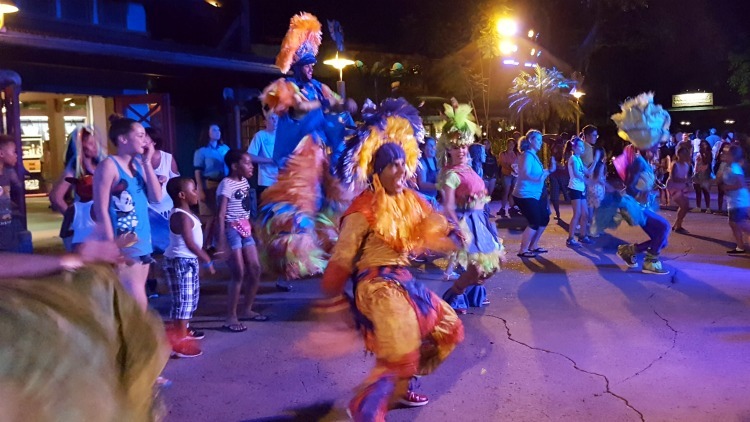 We always love a good party and the Discovery Island Carnivale is lively and fun! We actually stumbled upon this one night while waiting for the Tree Of Life Awakenings to begin. Performers in brightly colored Carnivale clothes sing, dance, play music and even prance around on stilts. Audience participation is encouraged, and kids and adults alike had a great time. There are a number of parties throughout the night so just check the Animal Kingdom schedule if you want to join the Carnivale. Everyone in my family loves this ride…except my husband. It doesn’t matter where he sits, he is always the one that gets so drenched that he leaves a trail of water behind him as he walks off. My little Keira loves sitting next to daddy because it means she gets soaked too. Now the girls and I have another reason to love this ride because we can ride it at night for a completely different experience. 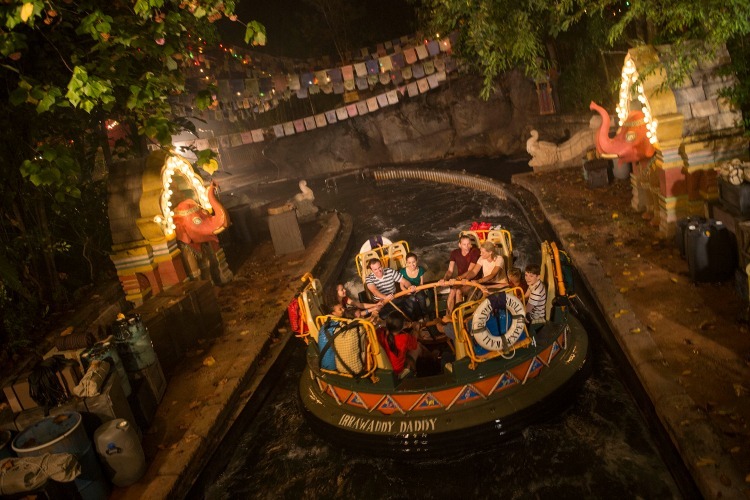 According to Disney, Kali River Rapids at night reveals even more mysterious twists and turns through the rainforest. I wonder if that means more waterfalls for my hubby to get stuck under? Thank goodness he’s a good sport! 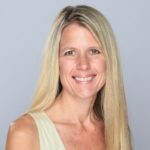 TravelingMom Tip:You may want to wait until warmer weather to try this because even sunny Florida can get chilly at night. This is at the top of my list for our next visit to Animal Kingdom. In the past, the Kilimanjaro Safari stopped running when the sun went down. We always had a great time, but the nocturnal animals were often sleeping or hiding out of sight. Now we can see what they get up to once the sun goes down. 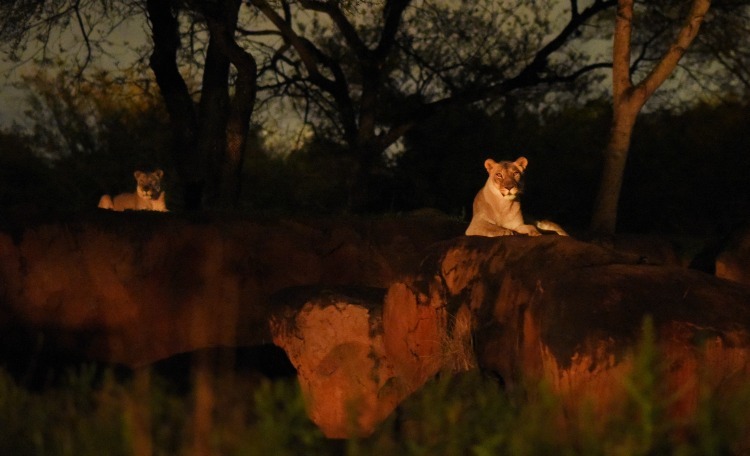 TravelingMom tip: While the nocturnal animals are awake at night, you will likely miss out on seeing a lot of the other animals due to the darkness. For the best of both worlds take the safari during the day and at night. If you only have time to do it once, I’d recommend experiencing it during the day. I love the Tree of Life. It’s the perfect symbol for what Animal Kingdom represents, and we love finding new animals among the over 300 carved intricately into the tree. However, we’d never seen the Tree Of Life quite like this! 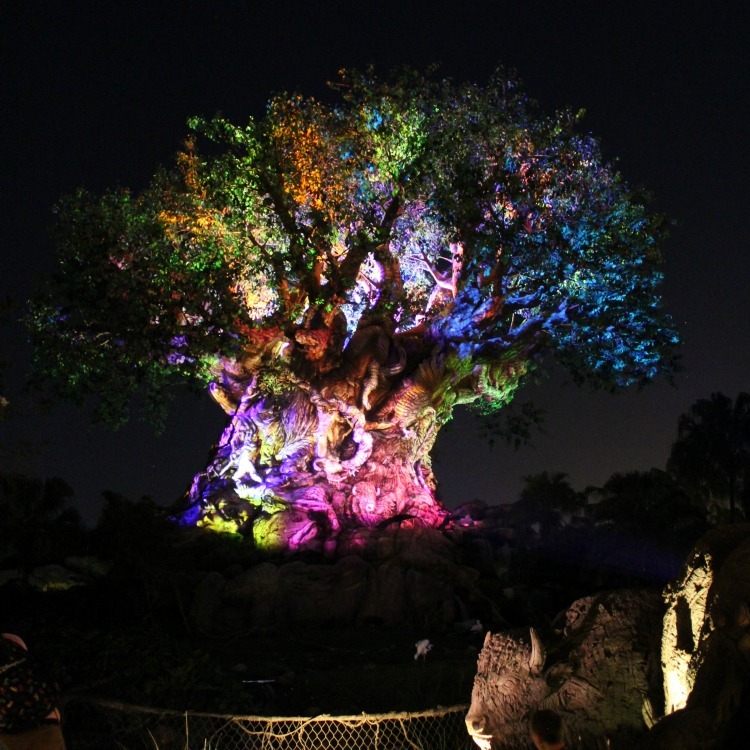 Every 10 minutes from the time the sun goes down until the park closes, the Tree Of Life “awakens.” It begins with the tree being lit with an array of beautiful colors. Pictures don’t even do it justice. It’s absolutely stunning in person! Just when you think it couldn’t get any better, hidden animals suddenly come to life! Hummingbirds fall in love, a young deer begins an exciting journey and a cute little fox pops its head out. It’s fun to hear the crowd “ooh” and “ahh” as new animals appear and it almost starts to feel like they’re real! This ranks among my favorite Disney attractions and it’s definitely worth staying up for. 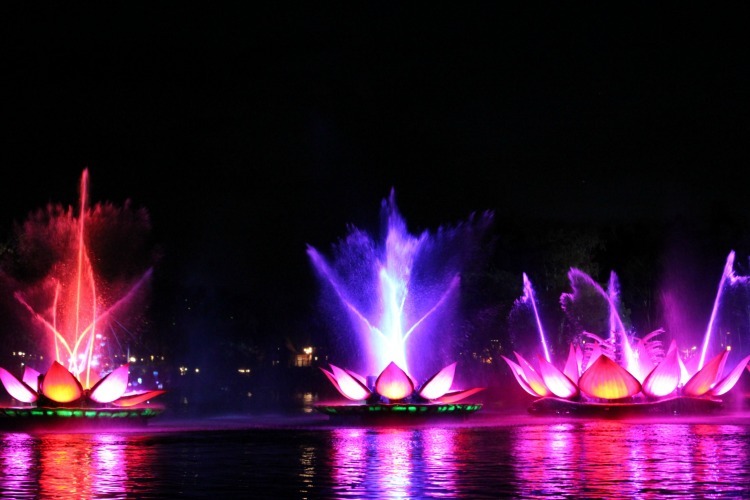 You won’t want to leave the park without catching the Animal Kingdom night show Rivers Of Light. 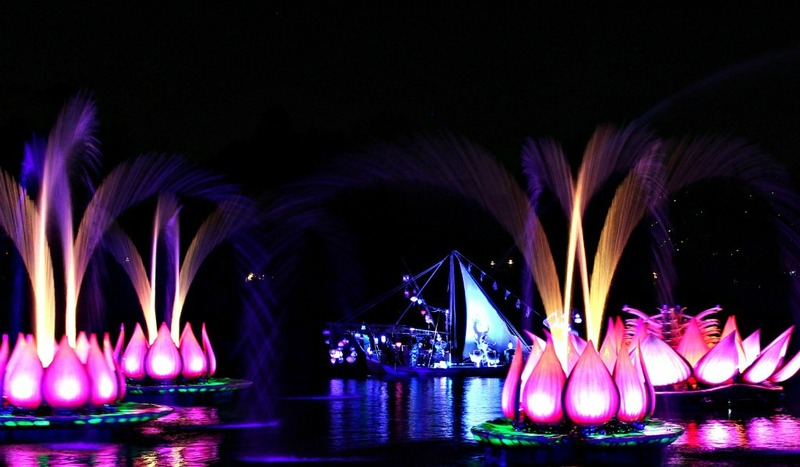 This show combines water, sound, and light for an experience unlike any other at Disney World. 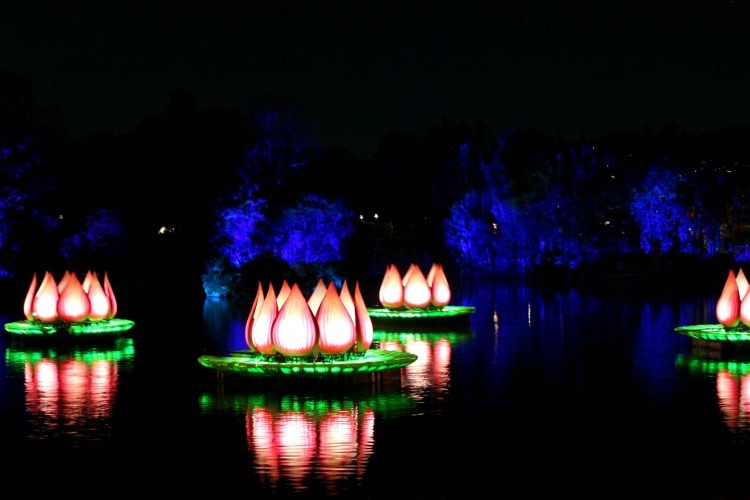 The first time we saw the brightly lit lotus flowers floating across the lake, we knew we were in for a good show. 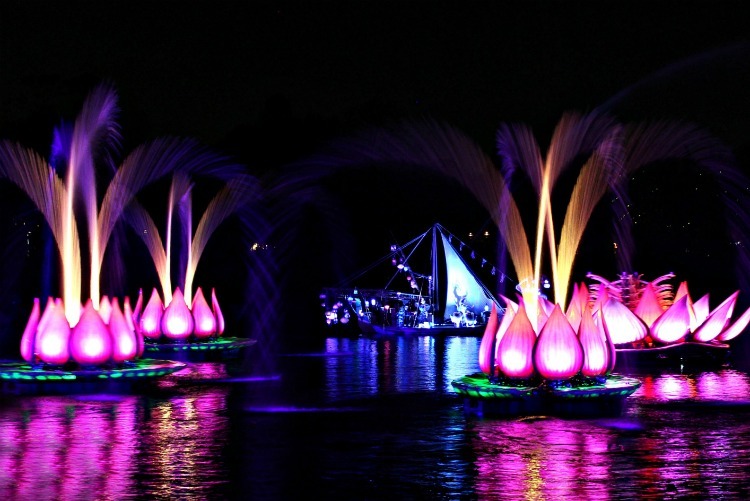 The show begins with lotus flowers opening up to spray fountains of water that move in time with the music. 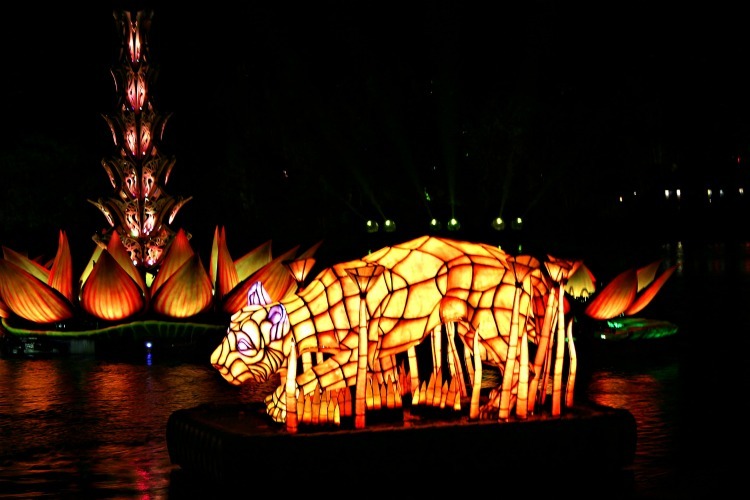 Keeping with the nature theme of Animal Kingdom, there were brightly lit wild animal floats as well. For my girls, this was their favorite part of the show. 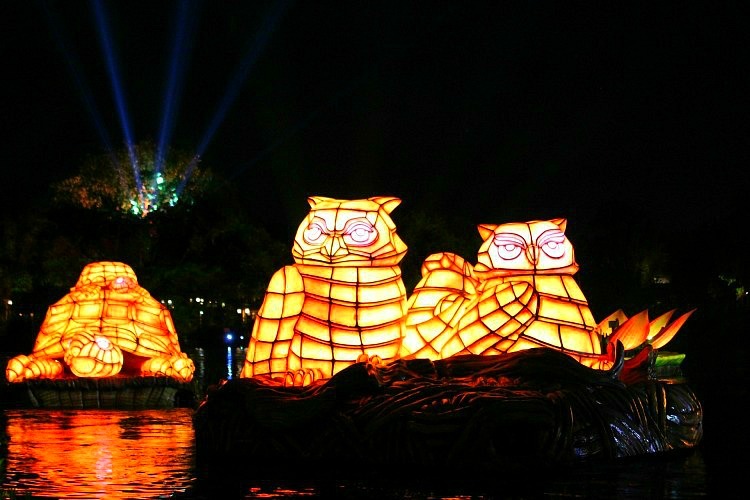 They thought the brightly lit animals were very “cool”. My favorite had to be the images reflected on the water as it’s sprayed against the sky. It’s pretty amazing how they pull it off and the effect is spectacular. If you pay close attention, you’ll even catch previously unseen footage from Disneynature films. 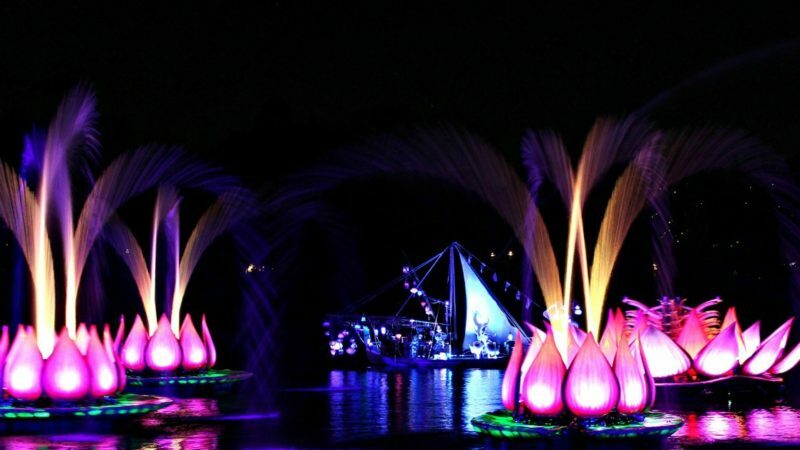 There are plenty of great seats for Rivers Of Light and the best seats for you depend on what you’re looking for. For the best overall view of the show, you’ll want to sit in the seats up high near the back. Another advantage is that sitting near the back allows you to beat the crowd when the show is over. However, if you are planning to use your camera, you may get a lot of pictures of other people taking pictures or even poles obstructing your view. This was one of my shots on a previous trip. Most recently, we managed to score seats in the front row. It’s a completely different angle but I loved being able to take pictures without anyone in front of us. We also enjoyed seeing everything up close. Where you decide to sit depends on your personal preference. If you’re looking for the best view of the overall show, sit up high near the back. If you plan to take lots of photos and don’t mind the lower angle, choose a seat down front. TravelingMOM tip: You’ll have to leave your stroller behind. If you have little ones that may fall asleep during the show, sitting near the back will make it a lot easier to get out when the show ends. Otherwise, you may be struggling to carry a sleeping child up the stairs and through the crowd. Have you been to Animal Kingdom at night lately? If so, what were some of your favorite nighttime attractions?